Well last evening we got the news to have CiCiBlue all wrapped up and ready to go by 8:00 A.M. this morning for her physical. We woke up about 6:45 A.M. to get the kids out for their walk, make our coffee, feed them and get stuff to bring to the waiting room. We actually walked out the door here at 7:57 A.M. We are GOOD! 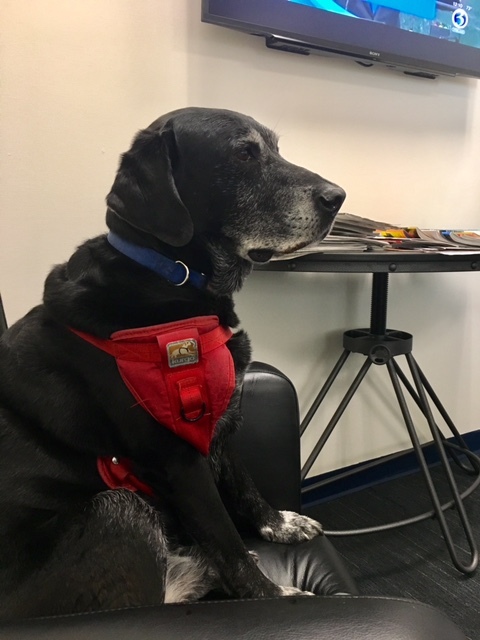 We entered the waiting room, which by the way had windows, comfy chairs, a coffee machine that made hot chocolate and was large, and Lola settled. CiCiBlue was taken in to be inspected right away, no waiting. Yes, I'm really liking this place already. We have a Cummins engine and a Dynomax chassis, (Country Coach design) and we are now at a Fire engine repair shop that services Freightliner and Cummins. Denise is the front desk person this morning and asked if we had other paperwork for work that was done recently on our coach. I walked back through the service bays with Alex our mechanic and crawled into CiCi to find the paperwork and returned to the front. During the day we chatted, me trying to figure how we could get a discount. I even tried the "weary woman with three large dogs?" Denise said, no, sorry, but she loved that I was trying! What I did find out was Freightliner parts are already discounted and I'd be doing ok. Soon after this Alex returned to let me know that while we had our rig over at Cummins having work done, they never changed our air filter. We figured, silly us, that "please change the filters" would have covered all of them. From now on it will be something we will specifically ask for. Alex said it hadn't been changed since 2010. He showed me the old one and yup, it was disgusting. I'm surprised CiCiBlue was running at all. The next thing was on our new alternator, the old belt had been replaced rather than a new one. A new belt was in order. The last thing was tightening a clamp then we could go. Then Sammy asked the next question that was on our mind. What about our exhaust system? Will we make it across the country with it being like it is now? The service manager simply said, NO. He said we would make it to South Carolina but that's it. Our exhaust has multiple holes and would in fact be dangerous to our engine and us if we decided to travel. After hearing the sound our coach made when it was just idling, we said we would discuss it. Our decision was to cancel our plans for South Carolina and stay and have our coach fixed. The parts will be shipped two day air, on us, and the job will be about 11 hours. Wednesday we will go to a hotel for the night then on Thursday come back and collect our girl. (after emptying our pockets of our pennies) Actually it's not as bad as I had originally thought, and don't you get excited when you find that out, even though it's expensive.? Yes, brushes will be flying once again. Alex brought CiCi back out to her spot and I asked him if he would put blocks under the drivers side wheels so we could put out our slides for the weekend. We are now level! Slides out, kids happy to be home, as well as Roger and I. Even though our plans have changed this weekend we will have free and good Wi-fi, we get Netflix, bingeing tonight, and on Sunday we will be able to watch the Patriot's game. Life is good! We get to be surrounded by cool fire trucks. I so feel like a kid!! I finished! 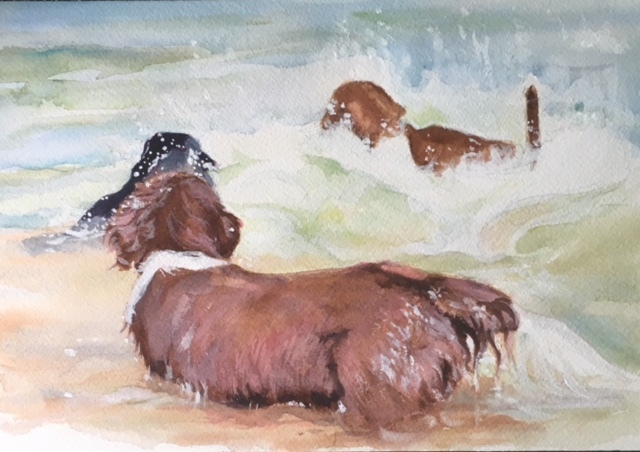 My first watercolor "water and dogs". Really pleased how it came out, so you know there will be more!! Lola is looking at her watch so it must be time for their dinner . Time to go. Have a great night and see you tomorrow.